A typhoon caused great damage in Yamanashi prefecture in Japan in 1959, where many of Japan's hogs were raised. Farmers in Iowa donated 36 lean meat breeding hogs to replenish the stock. The animals were shipped on a US Air Force cargo plane equipped with special crates. The President of the Iowa Corn Growers Association and his wife accompanied them on the trip.This was before the advent of jet cargo planes, so the hogs made stops at several islands as they crossed the Pacific Ocean. 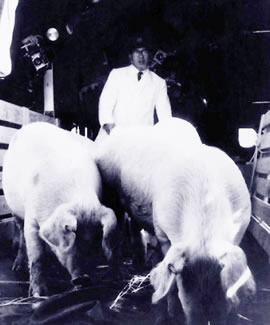 At each stop, the farmer and his wife bathed the hogs so they would not get overheated. After the hogs arrived safely in Yamanashi, they enjoyed a good life in new facilities. By the time the last Iowa hog died nine years later, they had produced some 500,000 offspring.